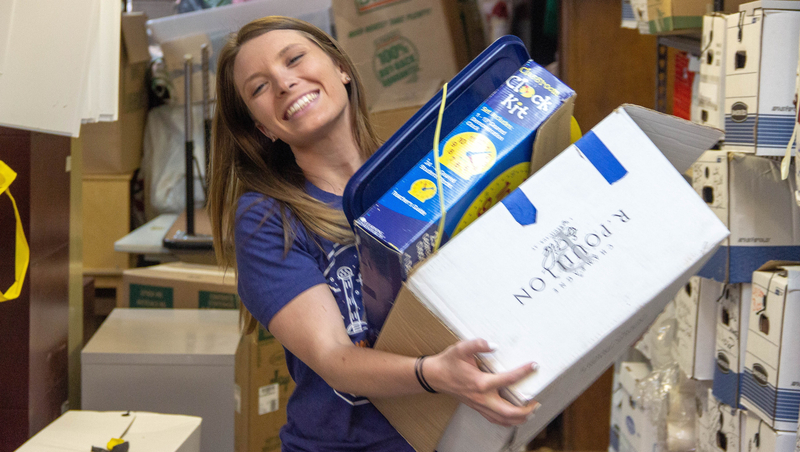 Moving a century-old nonprofit across town was no easy feat for Onward House staff. When the newly renovated Hank & Kim Marshall Community Resource & Education Center opened, it immensely grew our capacity to serve adults – but now we are again finding ourselves in need of more space! Our nearby storage facility needed some work. There were boxes left over from the move that hadn’t been unpacked, lots of documentation we wanted to keep (and some we could shred), coat and book donations waiting to be distributed, and an abundance of maintenance supplies and remnants from our building renovations. Our hard-working staff was focused on serving the needs of the community, but we needed to start thinking about utilizing our storage space more efficiently. West Monroe Partners accepted the challenge for their first ever #WMPDayofChange, sending us 16 of their employees to help us kick-off a summer-long project to get our storage area cleaned up. They lifted, they dusted, they organized, and they gave 110% to help us begin to transform our storage area into a place where we can offer more services in the future. The team also helped us prep our School Age classrooms for the summer program, and put together packets and reorganize The Lab for the first business incubator cohort on June 5! Thanks to our friends at West Monroe Partners for helping Onward House make changes that will have a lasting impact on those we serve. See our full set of photos from #WMPDayofChange on Facebook.